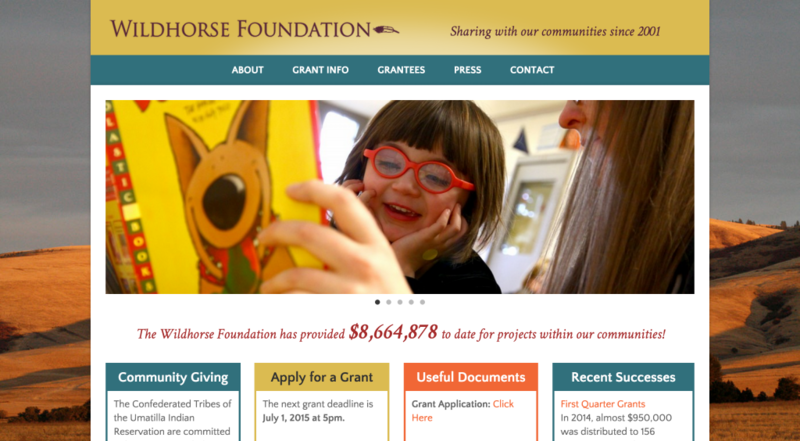 The philanthropic arm of the Wildhorse Resort and Casino, run by the Umatilla Tribe in Pendleton, Oregon, was once only represented by a single page hidden deep within the Casino website. Ready to make their mark on the world just a little bit bigger, the Foundation felt it was time to have their own site. In this day and age it is unusal to have the opportunity to create a new site from scratch with no previous content, or design elements to work from as a base. This was an exciting project in that were tasked with creating the site acrhitecture and SEO friendly content, while maintaining simplicity and user friendly navigation. We did not need to go far for beautiful images of the region that is home to the Umatilla Tribe and drew from the natural colorscape to invent a complimentary color palate.